Are you tired of many low budget massage chairs that promise to deliver only the best but somehow always fail? The best therapeutic features are usually applied only to the most expensive models. While all may not be your value for money, there is one to take into a consideration. Inada DreamWave massage chair is a new upgraded version of its predecessor Inada Sogno DreamWave. It is a highly customizable massage chair with an incredible number of massage options and techniques. According to many online massage chair reviews, the Inada DreamWave is a nearly complete package that has been called the best massage chair in the world. It’s definitely one of the most expensive massage chairs available. Do you think this chair has all that you’re looking for? With a detailed Inada DreamWave massage chair review, we here to help you to make a right choice. Inada DreamWave or Inada Sogno DreamWave? NOTE: Before reading any further, let’s clear the confusion: The Inada Sogno is an older model of the Inada DreamWave. Sogno DreamWave massage chair is a bit cheaper, and it still might be available from certain Amazon suppliers. Inada DreamWave is an upgrade of the Inada Sogno. Redesigned is now available with improved features. Inada massage chair may be the top of massage chairs, but the S-track design is a disappointment. 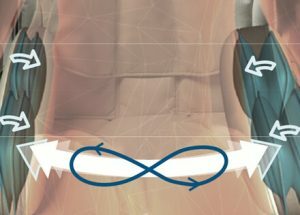 The quad rollers follow the curve of your spine, which results in a therapeutic massage but they don’t extend any further. Many massage chairs with a lower price tag have an inbuilt L-track design, which extends all the way to the glutes and thighs, providing a more extensive massage. By locating your pressure points, the massage chair adjusts the rollers to provide a more thorough massage. A huge plus with Inada massage chair is that you can also manually control these rollers, in case the chair missed to locate any pressure points. Zero gravity position is a beneficial feature that was inspired by NASA. In a reclined position your body weight is pressing down to the chair, and your knees are elevated above your heart. Nowadays, this feature is almost a regular with many massage chairs. Some of them have two-level Zero-G, some even have three. Inada massage chair only has one, which is a slight disappointment. The zero-gravity feature is still very beneficial because it provides a deeper and more thorough massage. There have been a few disappointments with Inada DreamWave features up to now, but massage options are not one of them. There are six massage techniques that extend from Human Hands, Kneading, Double Knead, Tapping, Shiatsu, and a combination of Kneading + Tapping. There are eight additional Deep Relaxation pre-programmed massage options which are the varieties of the original list. Inada DreamWave is highly customizable. The users are able to adjust speed, rollers, and intensity levels but the options vary from one massage technique to the next; not all are adjustable to the same level. Customers can even choose a massage duration to their own liking, modifying it up to 30 minutes, but the default setting is 15 minutes. With an adjustable timer you are able to control and adjust the duration of the airbags and rollers for every massage offered; from 5 to 30 minutes. Some massage chairs offer a seat vibration mode, but the Inada DreamWave substituted that for the back vibration mode. This feature can boost the sole massage experience when it’s combined with other massage options. 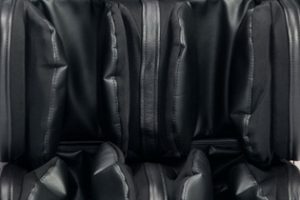 Another surprise from Inada is the number of airbags that come with it: the Inada boasts with 101 airbags, strategically placed to provide the best air massage experience. 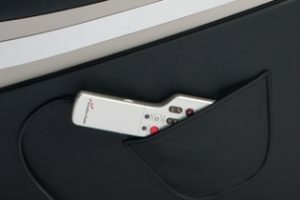 It’s also very customizable; you can regulate the air pressure, you can choose a specific area of the body you’d like to activate the bags for (arm, shoulder, seat, and food airbags). Moreover, you can always regulate the massage duration. The ability to customize this massage chair is incredible. A lot of massage chairs offer the heat therapy feature, but normally it’s always located in the lumbar area to provide the most relief for the lower back. Inada goes a step further. There are a back and seat heat available, and it’s customizable. Yes, you can choose between the back heat or the heat seat. You can have both, one or none. The only downside is that the temperature cannot be controlled. Body stretch has therapeutic benefits that soothe pain in the lower back if you suffer from chronic pain. 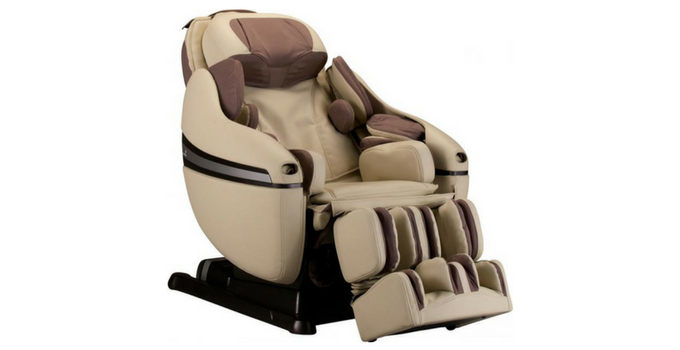 Inada massage chair can provide you with an instant relief from the comfort of your home. By taking off pressure from your discs and spine, the body stretch also helps to boost blood circulation. A calf and foot massage can be completely off with some massage chairs. Sometimes it’s non-existent, sometimes even too painful. Inada’s calf and foot massage is praised by many. As a combination of airbags and rollers, it provides a soothing relief for all those who spend a lot of time on their feet. Counting all the features this massage chair has to offer, there is a definite learning curve to this massage chair and its remote. While the features are placed logically, the users might need some time to figure the way around it. With some persistence and patience, you’ll be able to get a decent massage with a bit of effort. Still, the remote control does an excellent job when it comes to choosing and adjusting your body massage preferences. The DreamWave massage chair comes from a Japanese manufacturer Inada. The company was established in the 1960s, and their goals are to contribute to the health of the society and to provide quality to their customers. On their website, they offer various massage chair models. Apart from Inada DreamWave, they offer Inada MedicalChair, Duet, Flex 3S, Inada chair embrace deluxe, Inada Zero-G, and a few others. Overall, their website is quite poorly set. We were not able to find and instruction manuals, and links to warranties, nor assembly videos. We found another website for the USA market with models, warranty, and all additional information on the massage chairs available. The users can find the information on the extended warranty of the massage chairs, call a support center, and register their product. Inada DreamWave massage chair is made in Japan. The online reviews claim that the chair comes with a clear and well-written manual which is a rarity. The massage chair comes with a three-year warranty on parts and labor, as well as on-site service. For more information, you can find the warranty here. DreamWave is made of synthetic leather and comes in different colors: black, brown, dark brown, red, and TruBlack. The latter is the only variation made of genuine leather. The chair weighs 253 lbs. and is able to accommodate users with a height range from 5’ to 6’5”. There is no specific limit to the maximum user weight. In the same price range, choosing between Luraco i7 massage chair and Inada is difficult. After all, they are both premium massage chairs with advanced features. Luraco may be excellent if not an even better competitor to Inada. 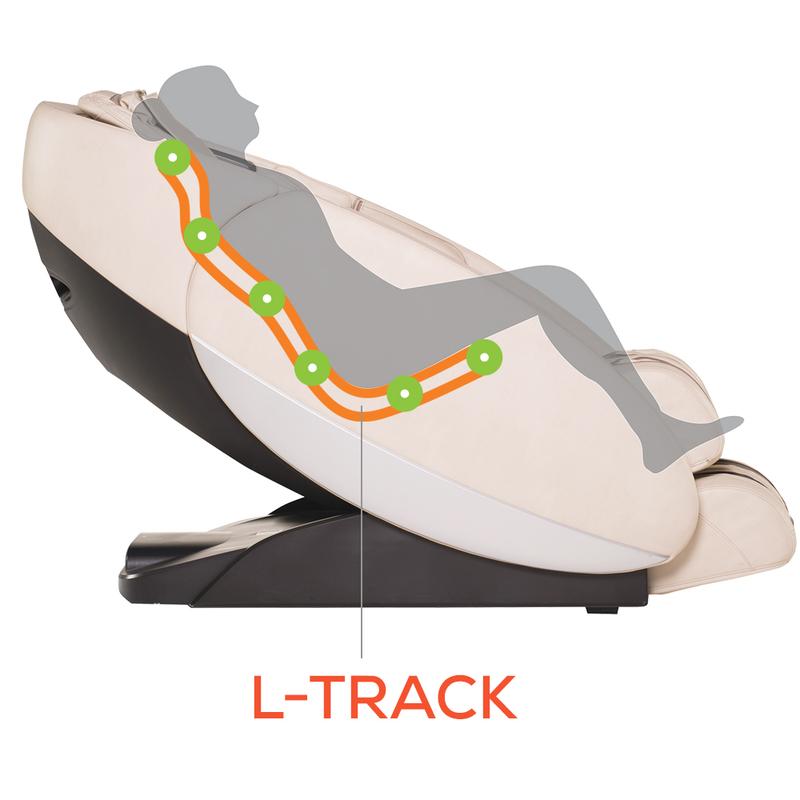 The S-track design is common to both massage chairs, but Luraco goes one step further. It enables the rollers actually to move away from the massage track. With its 4D technology, Luraco i7 is able to provide a more thorough and deeper massage. In terms of massage options, Luraco is definitely an excellent choice, but it’s nearly impossible to match Inada with more than a thousand massage combinations. Heat therapy is a common feature to both of the massage chairs. 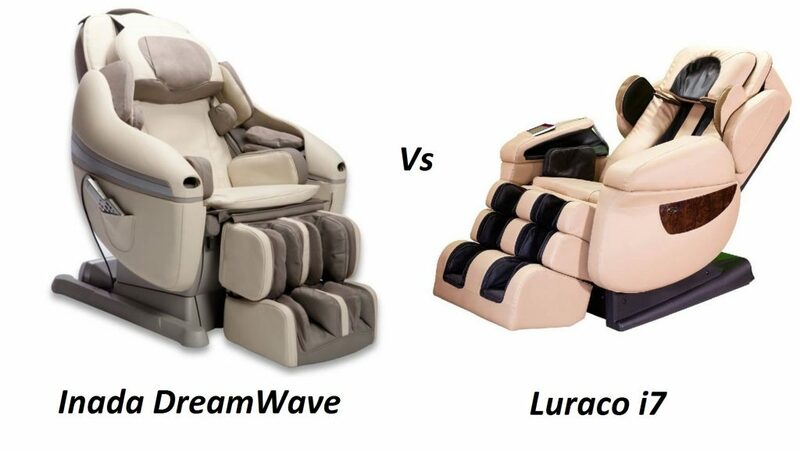 The DreamWave massage chair already enables some customization, but Luraco goes even further. It provides heat in the lumbar, seat, and foot area. Moreover, it also allows the users to adjust the heat with five different levels of intensity. Inada, sadly, lacks that function. Luraco i7 massage chair has 80 airbags located on the chair, but when it comes to air massage mode, the Inada massage chair has a strong advantage with its 101 airbags. It is a close match between the two since they both offer premium features to its users. Inada massage chair comes with a wide number of massage options that’s highly customizable. On the other hand, Luraco i7 massage chair offers innovative features with an additional healthcare device. When it comes to drawbacks, the two are also in the same category. For the price tag, they should both come with three zero-gravity levels, not only one. Apart from that, the space-saving technology is a feature a lot of users aim for. While it’s not a must, it’s definitely a welcome addition and a huge benefit. Human Touch Novo XT is a massage chair in the similar price range to Inada. At first sight, it may seem as if it has it all because it’s the only massage chair, certified by chiropractors. The S-track in Inada gets substituted by an L-track with 3 different levels of massage depth in Novo XT. Furthermore, the massage extends all the way to the thighs. This is a definite advantage to Inada. The air massage mode is beneficial and therapeutic with Novo XT and its 36 airbags, but this feature is taken to a completely different level with Inada and its 101 airbags. Moreover, the massage is customizable and allows for many variants. 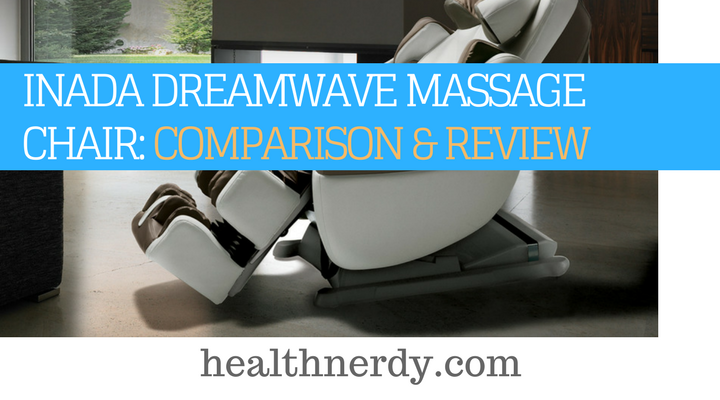 When it comes to massage options, Inada DreamWave is in a huge advantage. The Novo XT has 34 wellness programs. It offers various massage techniques, such as Shiatsu, Swedish, Thai, Sports, among others. It also extends this massage option to various pre-programmed routines, but it just cannot match with Inada, no matter what. DreamWave and Novo XT are a close match. They both offer something unique to their users, and at the same time, they’re both customizable. The design in Novo XT may not please everyone, but with a wide array of options the massage chair offers, it’s something to consider. On the other hand, Inada offers so man options that the users can never get bored of it. Whatever chair you decide on, we think you’d not be disappointed since they’re both quality chairs that provide therapeutic and beneficial effects to all that use it. First of all, Inada DreamWave massage chair is expensive. The lack of the L-track is disappointing, and the remote control may seem too complicated to even bother. The massage chair is heavy, and for this price, it could offer at least an MP3 support. On the other hand, the Inada massage chair is highly customizable. It does lack certain features that should have come with the package. When you look at the big picture, this is an amazing chair that packs a wide number of massage options, techniques, and even extra kicks, such as the back vibration mode or the heat therapy. Inada may have the reputation of the best massage chair because it deserves it.